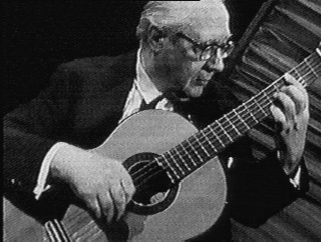 Andrés Segovia (1893-1987) is considered to be the father of the modern classical guitar movement by most modern scholars. Many feel, that without his efforts, the classical guitar would still be considered a lowly bar instrument, played only by peasants. Segovia's quest to elevate the guitar to a prominent position in the music world, began at the early age of four. His uncle used to sing songs to him and pretend to strum an imaginary guitar in his lap. Luckily for us, there was a luthier nearby and Segovia took an instant liking to the guitar. Although discouraged by his family (according to them he should play a "real" instrument), he continued to pursue his studies of the guitar. He set a goal for the guitar and himself early in life. It was, to bring Guitar studies to every university in the world, have the guitar played throughout the world, on every major stage, just as the piano and violin were, and lastly, to pass on his love of the guitar to generations to follow. He considered himself to be the messenger that would complete this impossible quest. He succeeded in all respects. Segovia gave his first concert in Spain at the age of sixteen, with his professional debut at the age of twenty in Madrid. His original program included transcriptions from Tárrega, as well as his own transcriptions of Bach and others. Many so called "serious" musicians believed that Segovia would be laughed off of the stage, because the guitar could not play classical music. In fact, Segovia astounded the audience. The only problem he had, was that the guitar could not produce enough sound to fill the hall. Over the coming years, Segovia would perfect his technique and push luthiers to experiment with new woods and designs, that could increase the natural amplification of the guitar. With the advent of Nylon strings, the guitar could produce more consistent tones, while also being able to project the sound much farther. Segovia's quest lead him to America in 1928 for his first concert in New York. Again he overwhelmed the audience with his technique and musicianship, and converted more dissenters to the classical guitar. His rousing success in New York led to offers for more appearances in America and Europe, and a trip to the Orient in 1929. Segovia, and the classical guitar had arrived. As Segovia traveled the world, he and the guitar became more and more popular. Composers such as Heitor Villa-Lobos began to compose original pieces specifically for the guitar. With their dark and melancholy mixture of dissonance and cello-like phrasing, Villa-Lobos' compositions in particular, seemed to fit the guitar perfectly. Segovia had also begun to transpose the masterpieces for the guitar. In fact his transcription of Bach's Chaconne, has become one of the most famous and difficult pieces to master. His transcription makes the Chaconne seem as if Bach originally intended it to be played on the guitar instead of the violin. Segovia's repertoire was increasing, as was the guitar's. His goal was becoming a reality. All that was left was the third and final part of his mission... to pass on the legacy to a new generation. Segovia had many students throughout his career. Among the more famous are Christopher Parkening, John Williams, Elliot Fisk and Oscar Ghiglia. These students, along with the many others, carry on Segovia's tradition, while at the same time expanding the classical guitar's presence, repertoire, and musical boundaries. Segovia not only taught students himself, he indirectly taught and influenced thousands and thousands of guitarists world wide. He is truly the father of the classical guitar. *Links are pictures of closest guitar, not the actual one(s) Segovia played. **From "The Classical Guitar: A Complete History"
See the Books and Videos page for publication information.